Sonia Samarth couldn't have predicted it--after only a day, her first advertisement had drawn dozens of responses. In the bustling city of Pune, India, with its winding alleys and exotic customs, Sonia is launching a brand new business: private investigation--using Hindu astrology as a crime-solving tool. In an ancient city steeped in tradition, Sonia's unique brand of investigation is raising eyebrows. But she seems to have found a niche--and, before long, a case of murder. When a cat leads Sonia to her very first investigation, she quickly unmasks a killer, using astrology as her guide. Suddenly clients begin streaming in: a persistent, handsome TV personality; a terrified bride-to-be; a missing husband with suicidal tendencies...all challenge Sonia's astrological abilities to prevent a crime. All apparently isolated experiences, but bound by an invisible thread. And while Sonia has stellar success in unraveling the truth, very soon she'll have to look closely at her own stars. Because the most notorious international criminal has just crossed Sonia's path--and he has his own plans for her future! Manjiri Prabhu lives in Pune, India. She’s been a filmmaker and television producer for several years and a writer of two romances, two mystery novels and a non-fiction book on Hindi films. She is currently putting the finishing touches on The Astral Alibi - the next book in the Stellar Investigation series. Sonia Samrath, the brain behind Stellar Investigation Agency. Jatin, the efficient assistant of Sonia. To begin with, the cover-page is really interesting. It is vibrant and attracts the interest of the reader. The book blurb is catchy and holds the attention of a potential reader. All said, the plot per se is unique – Use of astrology in solving crimes! 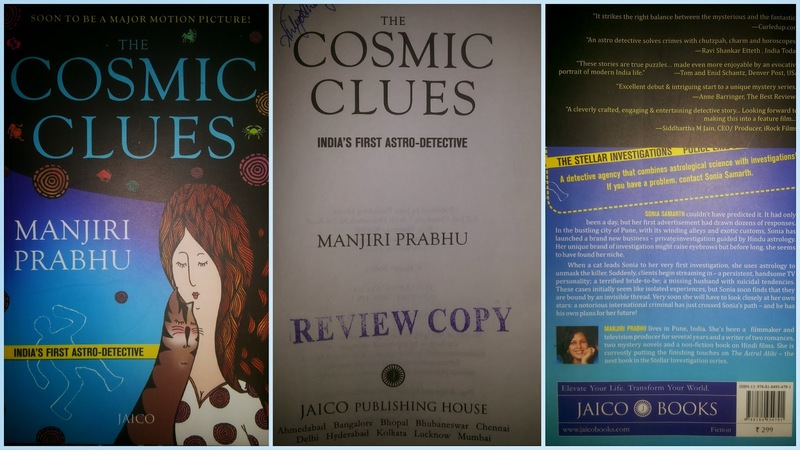 I would say that such a concept is never explored and the book also states – India’s First Astro Detective – which is true. Having said that, we Indians have this strange pull towards astrology. From naming a child to marriage to beginning anything new in life, we rely on astrology or consult an astrologer. Even if we are a non-believer, in one point or other, we would have blamed the strange positioning of planets for some mishap that we would have experienced. So, it is no exaggeration if I say that the concept is compelling! But, what makes this book really an awesome is the fact that the author manages to hold reader’s attention. Her writing style is simple and flows with an ease. Further, the book is not about one crime. This is about the Stellar Investigation Agency and their day-to-day work. So there are multiple crimes and I liked this aspect of it. It will give you a new experience altogether!